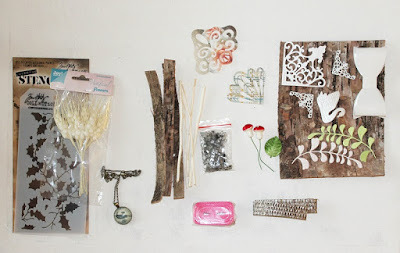 Almost a year ago, I got a challenge from a good crafty friend, Ingvar Kvinnesland, also called Dilly Dally among other scrapbookers and cardmakers. I was planning to do the challenge, but since changed so much this past year, I was waiting to get the crafty mojo back. This challenge has been on my desk, and kind of "kikking" me a bit. Now, as my mojo is comming back, and life is setteling in a new place, I took the challenge. 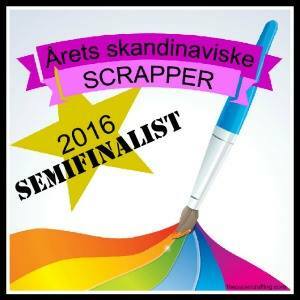 And this is the result (written for the Papercrafting in Norwegian). The plant had to be altered. The ribbon had to be altered. Only two of the die cuts could be taken away. The chain could not be alteredd. Alt least one of the wodden bits had to be used. 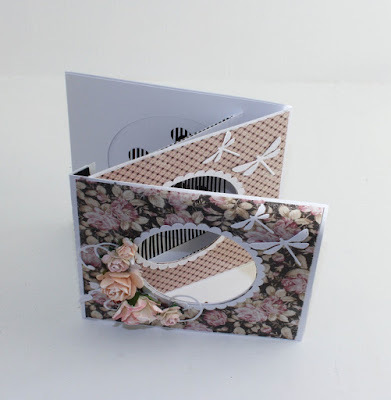 Since a lot of the diecuts were in pink, I decided to keep the finished result in pink colour tones. 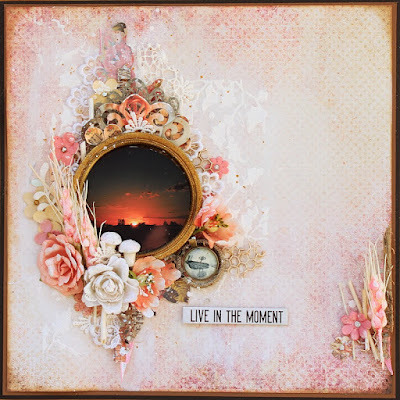 The finished result was a mixed media layout. 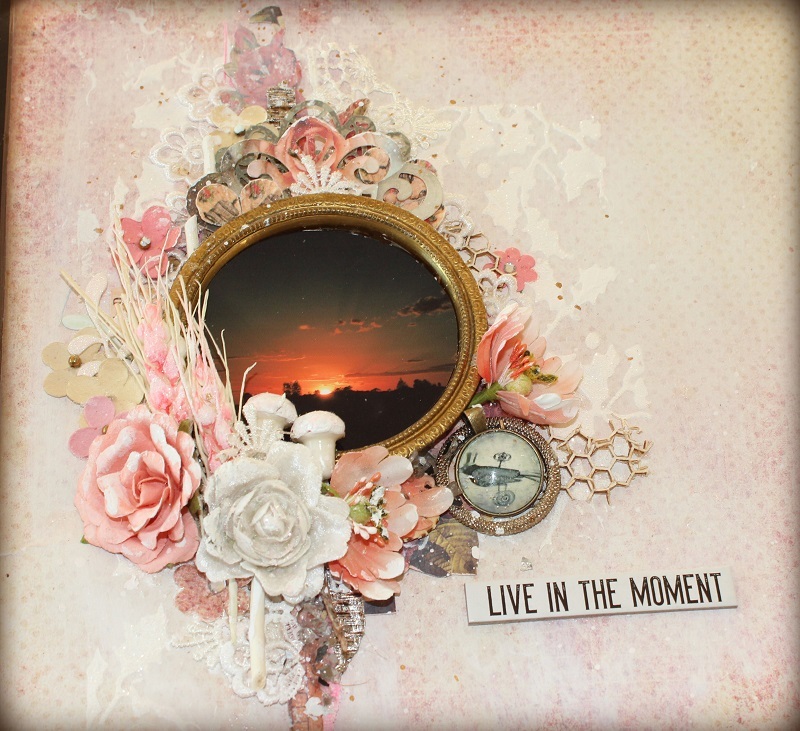 The background is an old paper from Prima. 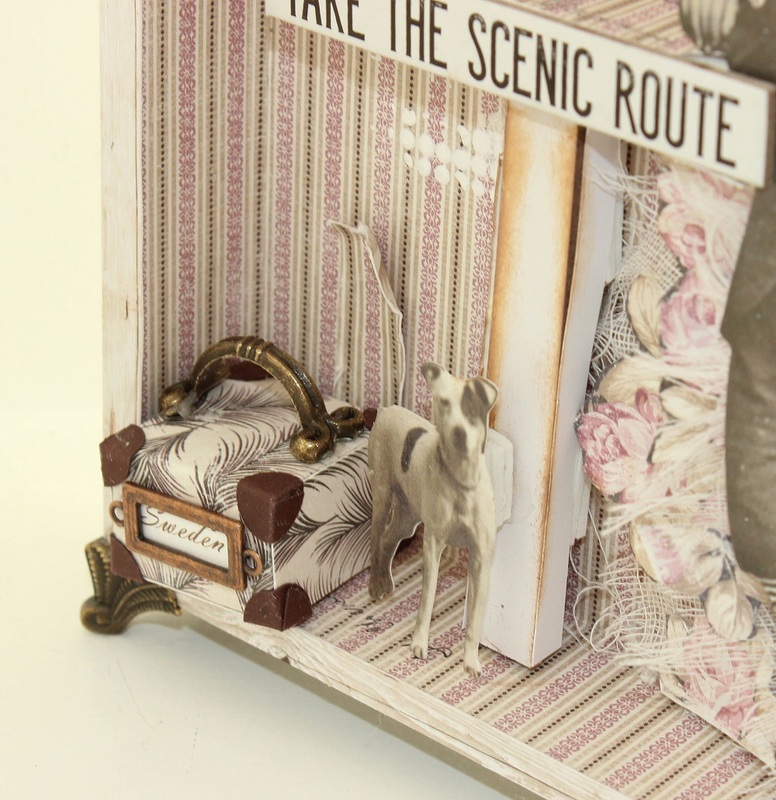 The pattern has been made on the background paper with th Tim Holtz stenzil from the challenge, gesso and white glitter. Then, die cuts, lace, chipboard and embellishment was added in layers. The photo was taken at sun rise by Uluru in Australia. 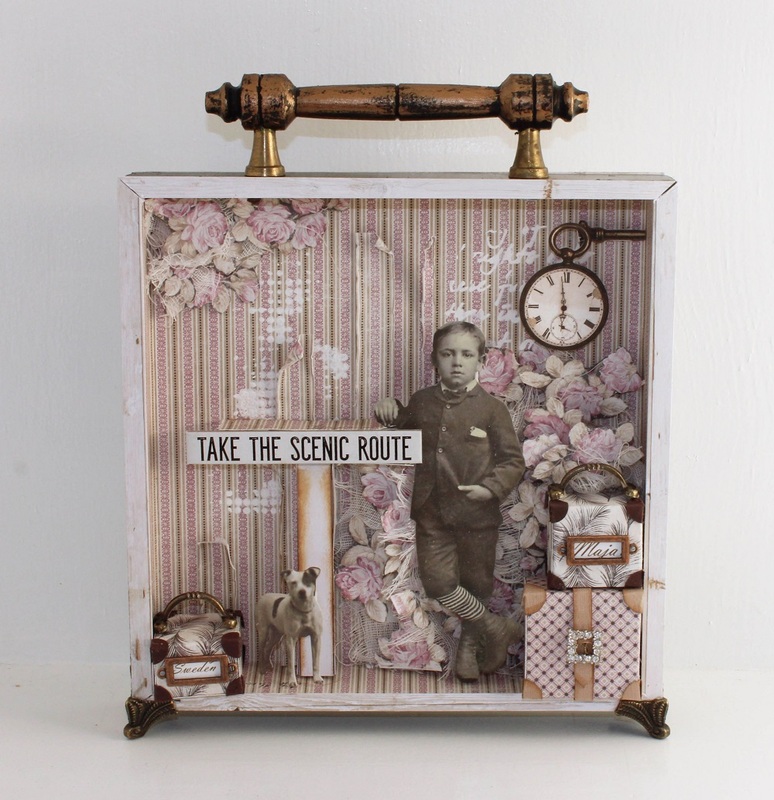 The photo has been added in a metal frame from an old clock. The grass had to be altered, and has been colourd with Kaisermist. At the end, I have also added some sprays og gesso to the layout. Challenges like this is fantastic fun. Try to challange someone else, and you might inspire someone greatly. 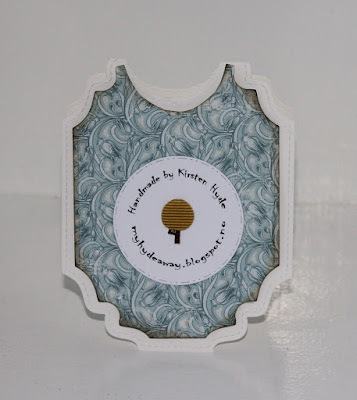 Today, I am showing you one of the cards on show for Creativation. 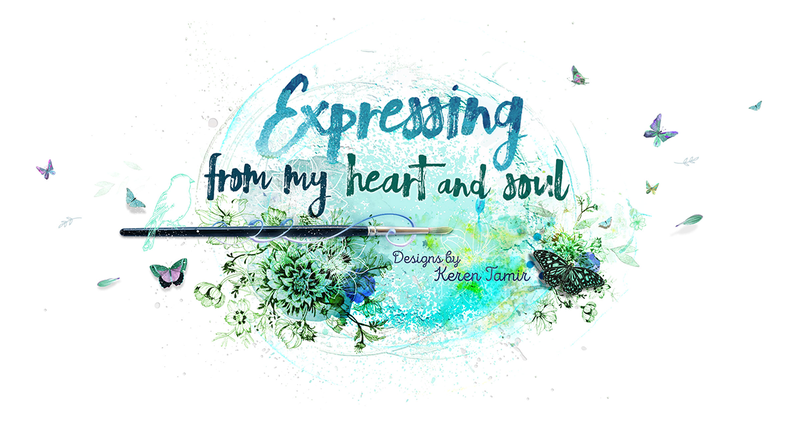 The stamps are from the lovly new stamp set Let Love Grow. The papers are from the Cotton candy paper pack. I have used 3d foam tape between the layers for dimention. 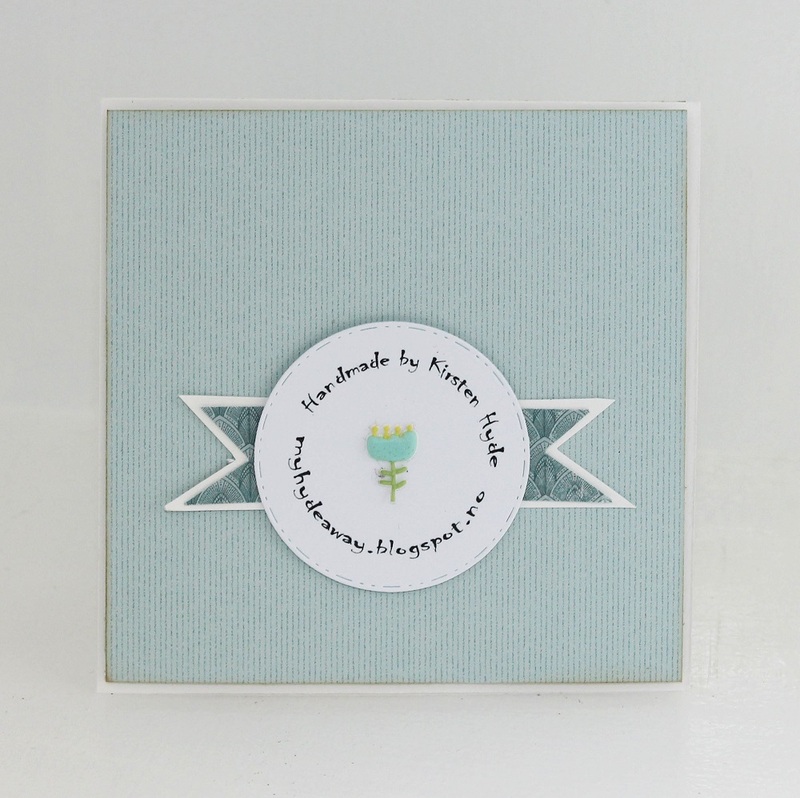 The inside of the card has been decorated with a strip of patterned papter, diesed out with the heart dies from the Lovelette stamp set at the top at the bottom of the strip. I have also created space for writing a personal message with a diecut created with the Fancy Rectangles & Layers. A lot of people have told me that they think dies from the big brands are very expensive. A lot of them are expensive, but my tips is that you should invest in a few standard dies from a good brand, and use them in a lot of different ways. 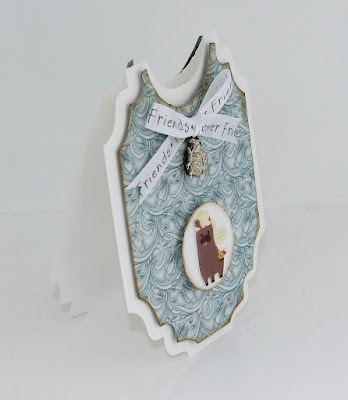 Here, I have used dies from LDRS creative in a few different ways to create cards with different shapes. 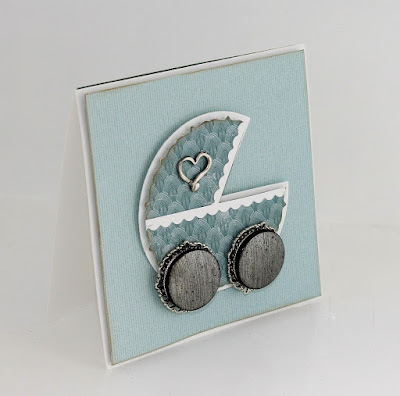 I have created four baby boy cards with dies from LDRS creative and papers from Maja design's new Celebration collection. 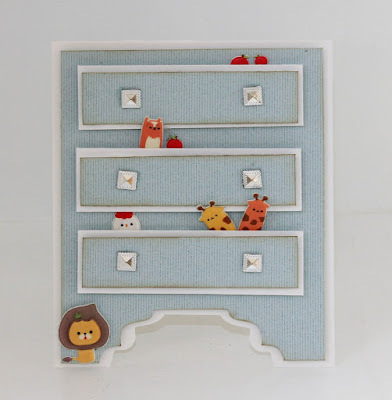 This card has been made with paper from Maja Design - Entertainment. 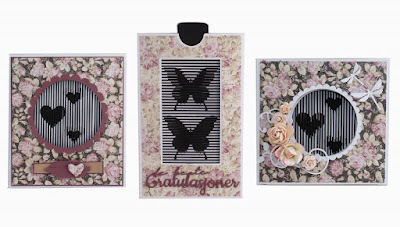 The dies used are from the set Fancy Rectangles & Layers Die Set from LDRS creative. 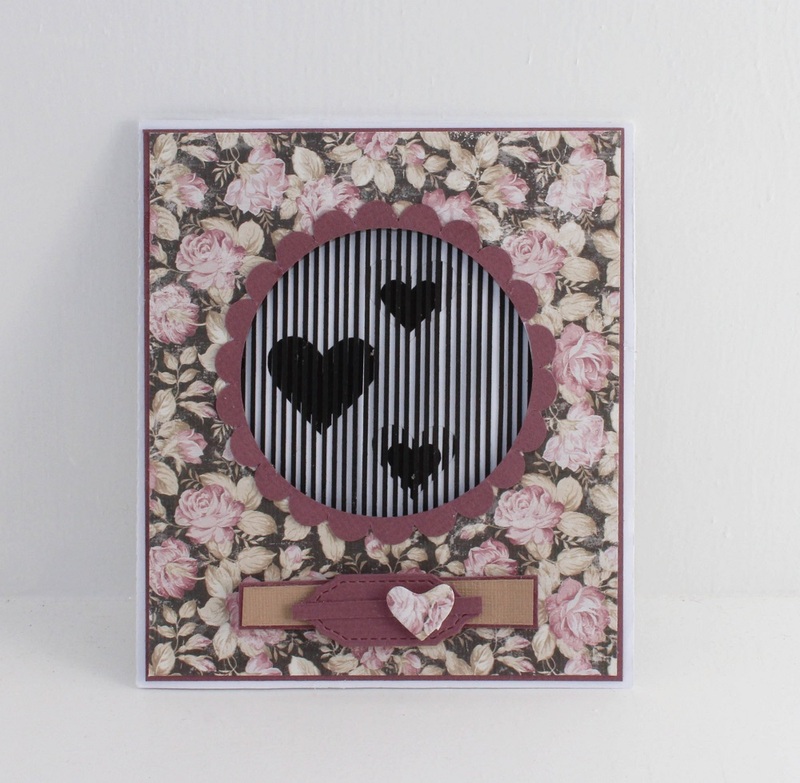 At the top of the card, I have used circle die from the Fancy Circles Dies set from LDRS creative. 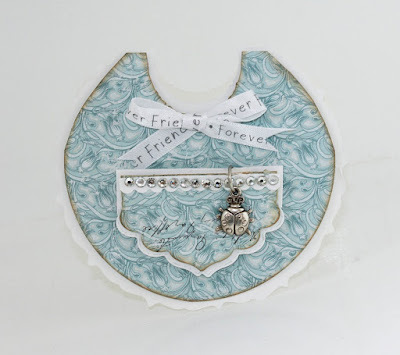 The circle on the front, has been made with a small circle die from the set Fancy Circles Dies from LDRS creative. 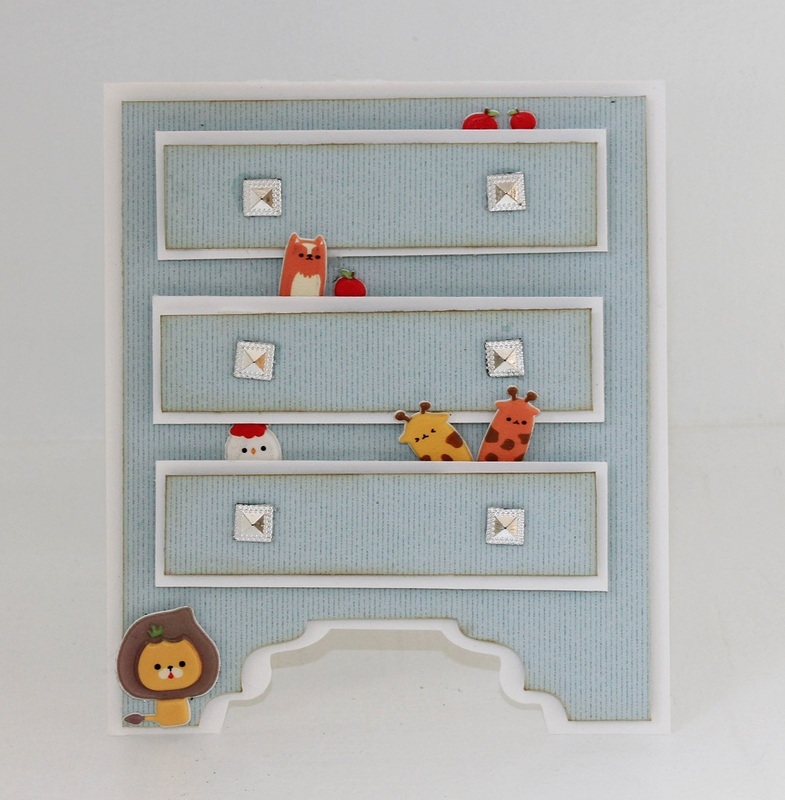 The little animal is a 3D sticker from the sweet Stickers - Animal Farm set. 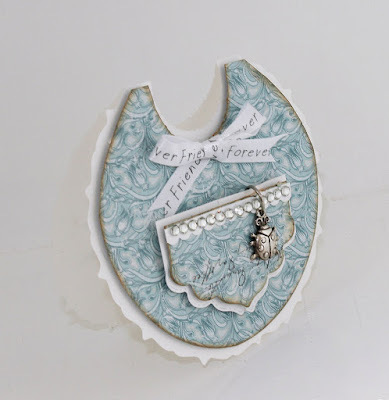 At the back, I have used a circular die created with a die from LDRS creative - Fancy Circles Dies. The small tree is a 3D sticker from Animal Farm set. This card is made as a normal tall card with. 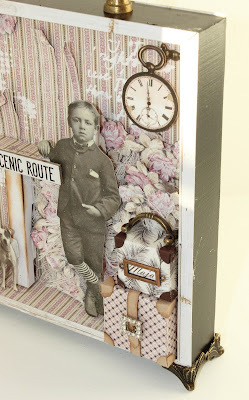 At the bottom of the card, I have created the legs using the Fancy Rectangles & Layers Die Set from LDRS creative, in the middle bottom of the card. All the animals are from a set of 3D stickers - Animal Farm. 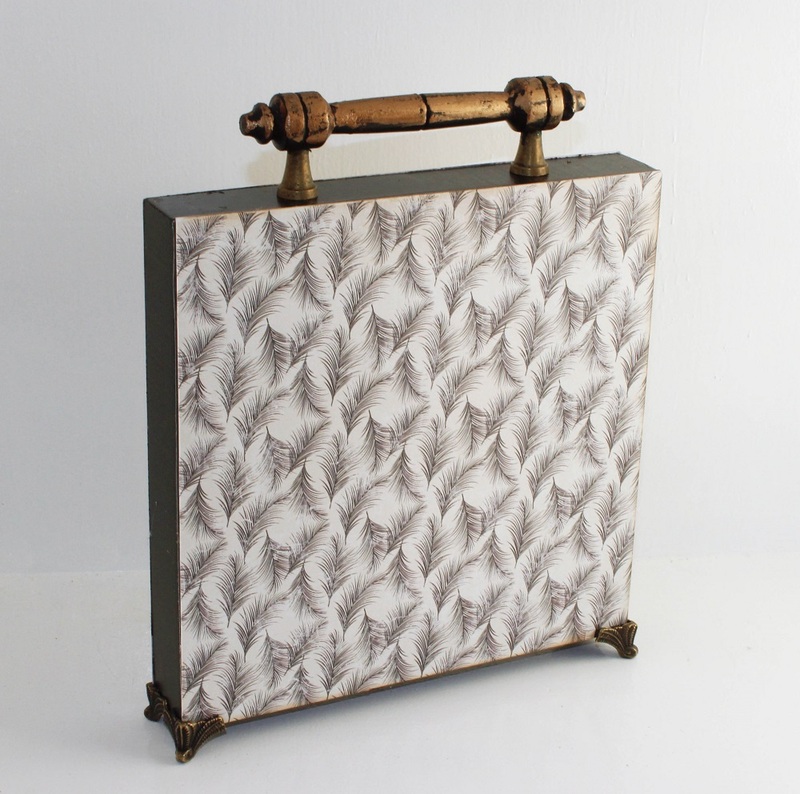 The handles for the drawers has been made with parts from a Rhinestone ribbon in silver. 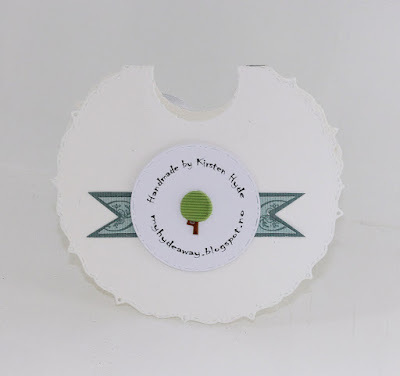 At the back, I have used a circular die created with a die from LDRS creative - Fancy Circles Dies. The small animals is a 3D sticker from Animal Farm set. 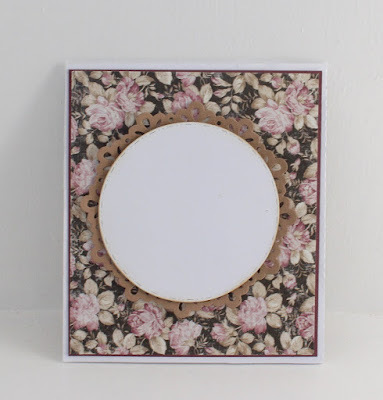 This card has been created with creating a large circle with a smaller circle at the top, using the Fancy Circles Dies set from LDRS creative. 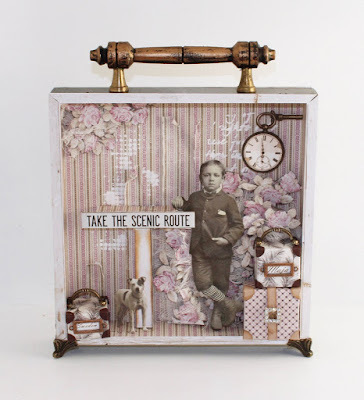 The pocket in the front, has been made with LDRS dies from the set Fan-TAB-ulous, The papers are from Maja Design - Entertainment. 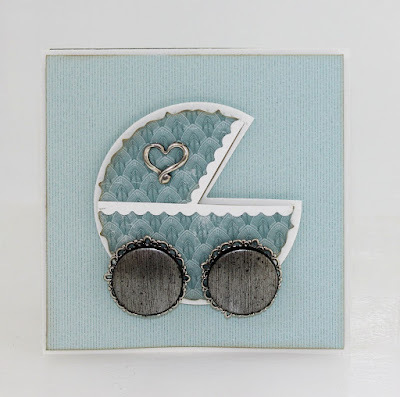 There are lots and lots of nice pram dies. 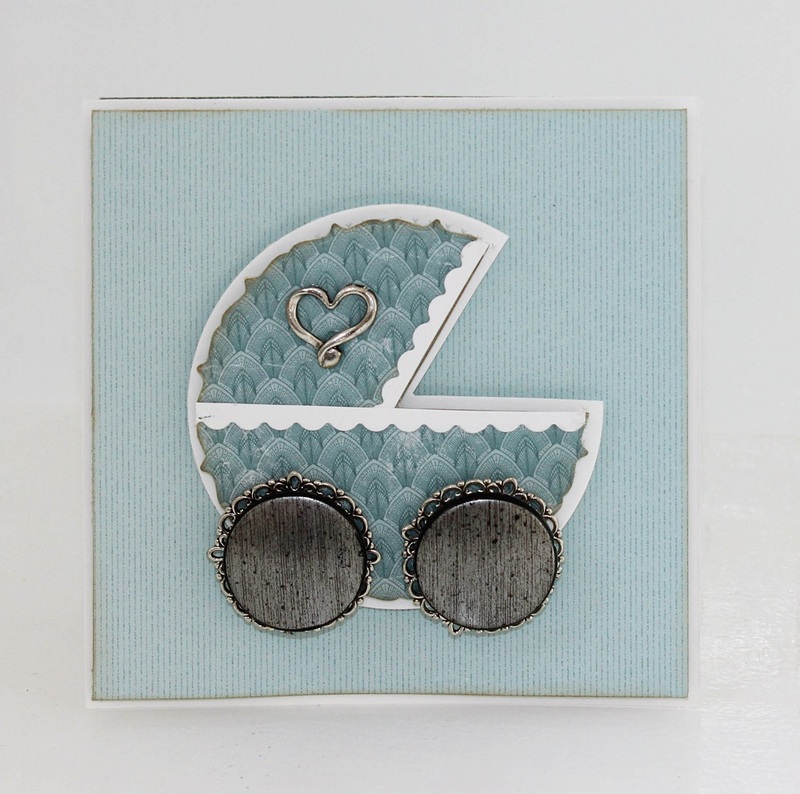 Here I have used two circle dies from the set Fancy Circles Dies from LDRS creative. I have cut away part of the circle to create the pram. I have used some old beads and metal circles to create the wheals. 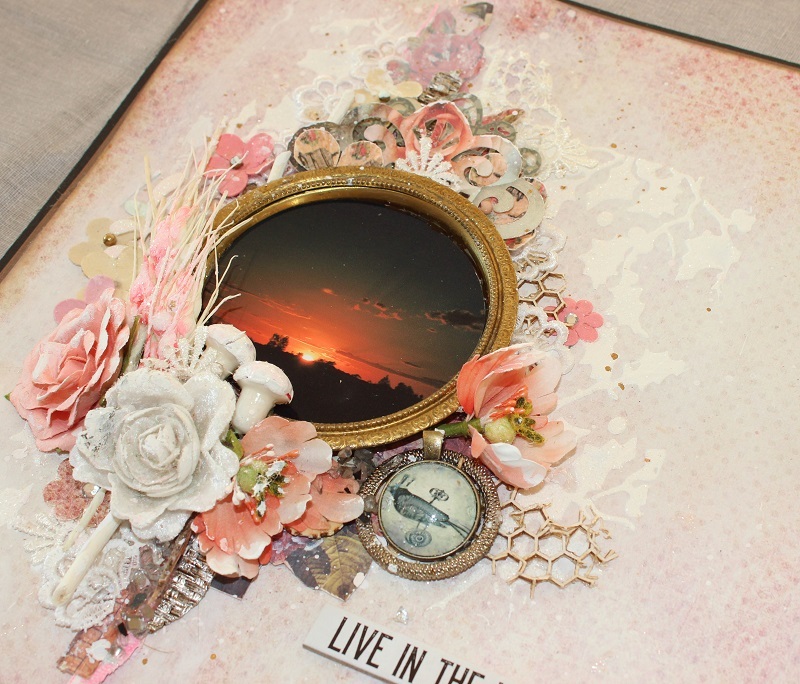 The papers are from Maja Design - Entertainment. At the back, I have used a circular die created with a die from LDRS creative - Fancy Circles Dies. 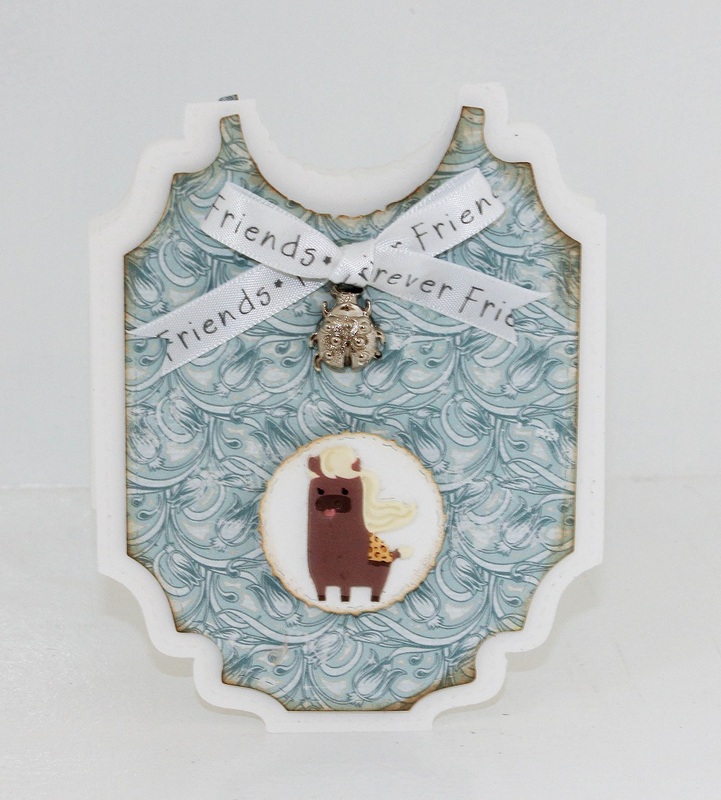 The small flower is a 3D sticker from Animal Farm set. 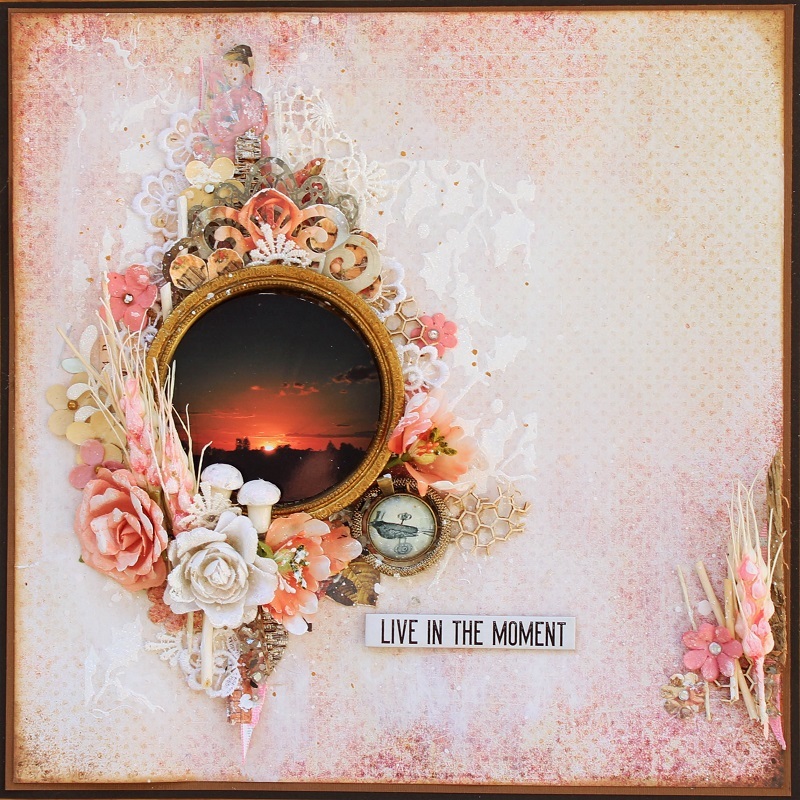 It's always fun to create with brand new collections. This time, I have created a shadow box for Hobbykunst. 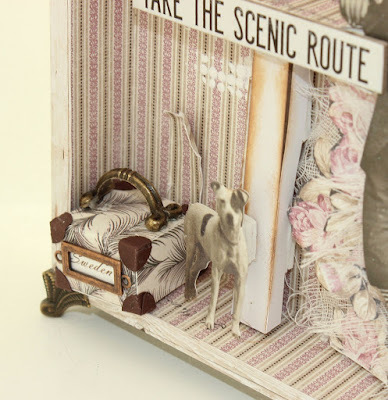 Here, I have used Maja's collection Celebration together with Kaisercraft's new Wandering Ivy collection. The box is made from thin wood. This is a wooden picture from a sale at Jysk, turned the wrong way round, and decorated inside. 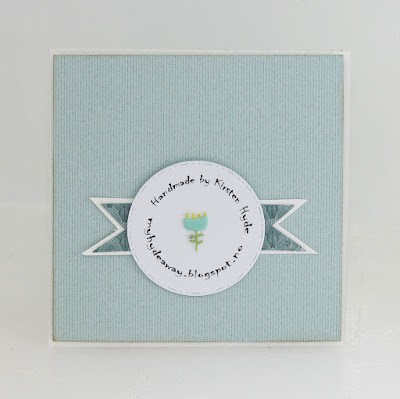 The inside has been decorated with papers from Maja Design: Jubilee - Celebration. The flowers has been cut from the same paper, and added in layers with cheesecloth between the layers. The suitcases has been made by hand, from small square boxes. The suitcases has got brown corners created from cardstock and a little handle. 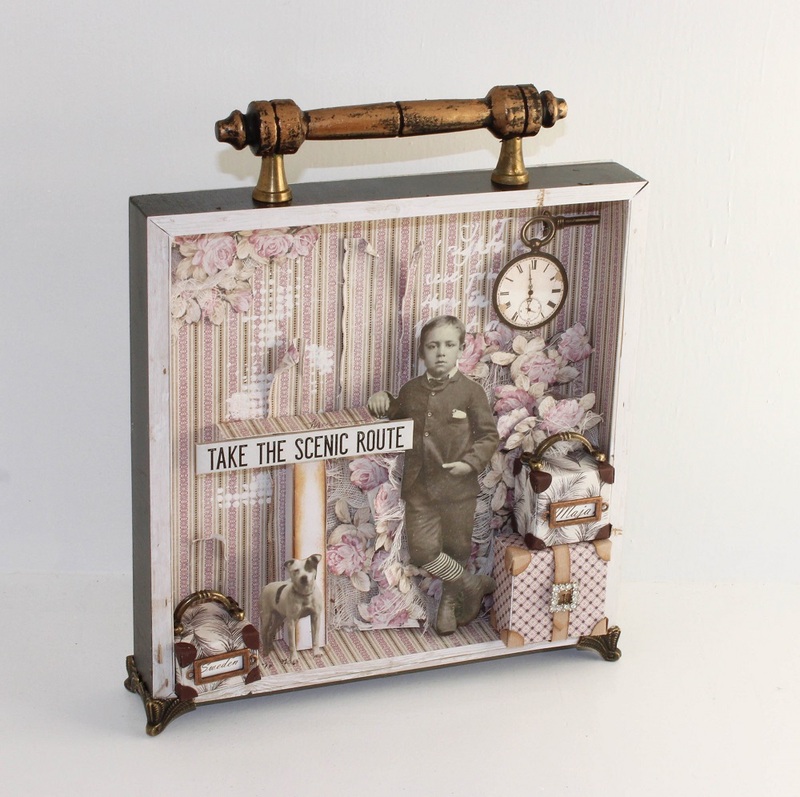 The dog and the boy is from Tim Holtz's Idea-Ology: Paper Dolls Die-Cuts. 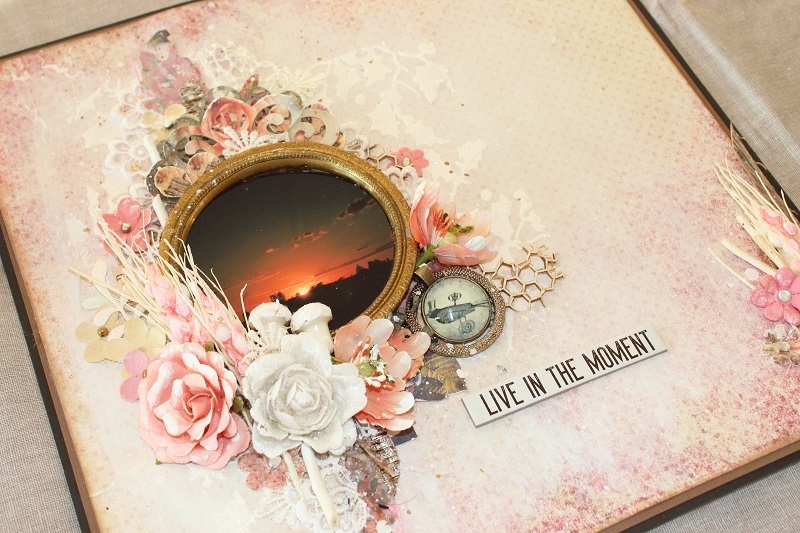 These motives are super in art work like this. The back of the frame has been decorated with papers from Maja Design: Party - Celebration. The handle is an old wooden handle from a draw. The handle has been painted black and decorated with Finnabair's wax. Today, I am showing you a card created for Creativation for LDRS Creative this spring. 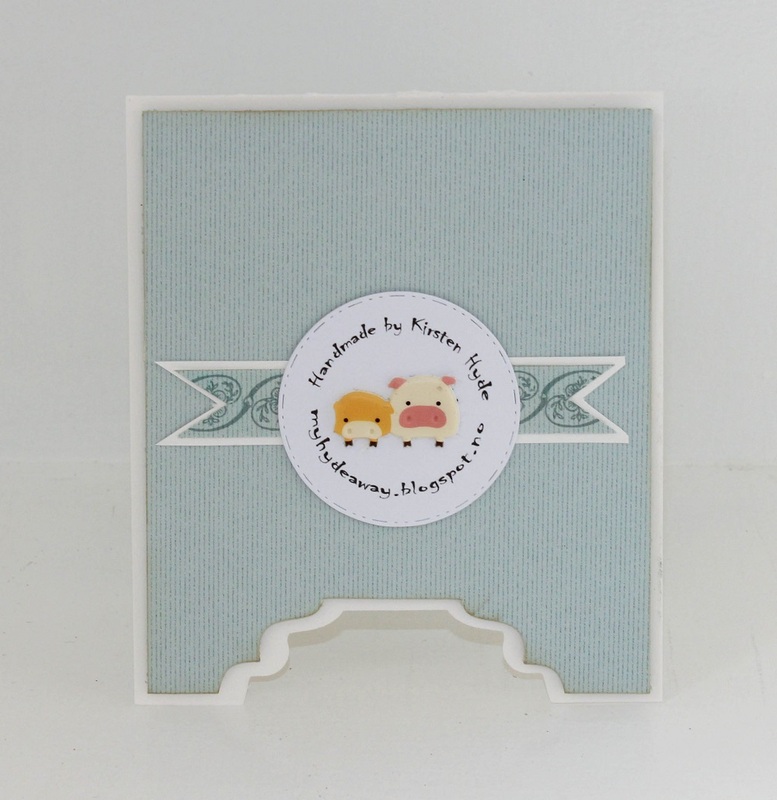 The motive, Dancing Queen, is a brand new image that will be available in shops i March. 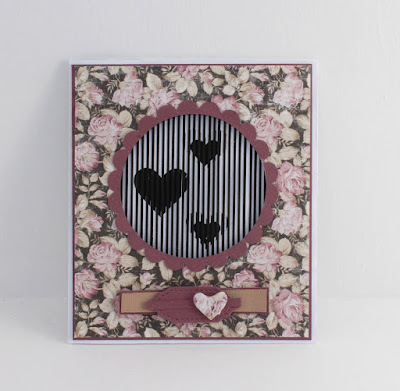 The card has been created with the Allifair Build-A-Card die set. 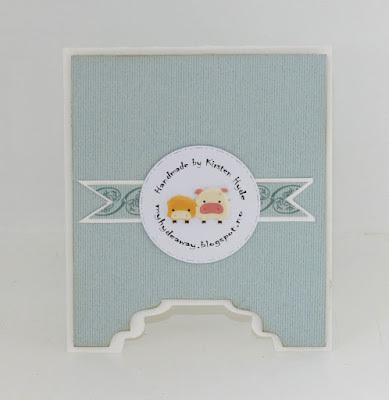 The motive has diecut with a die from the Fancy Rectangles & Layers die set. 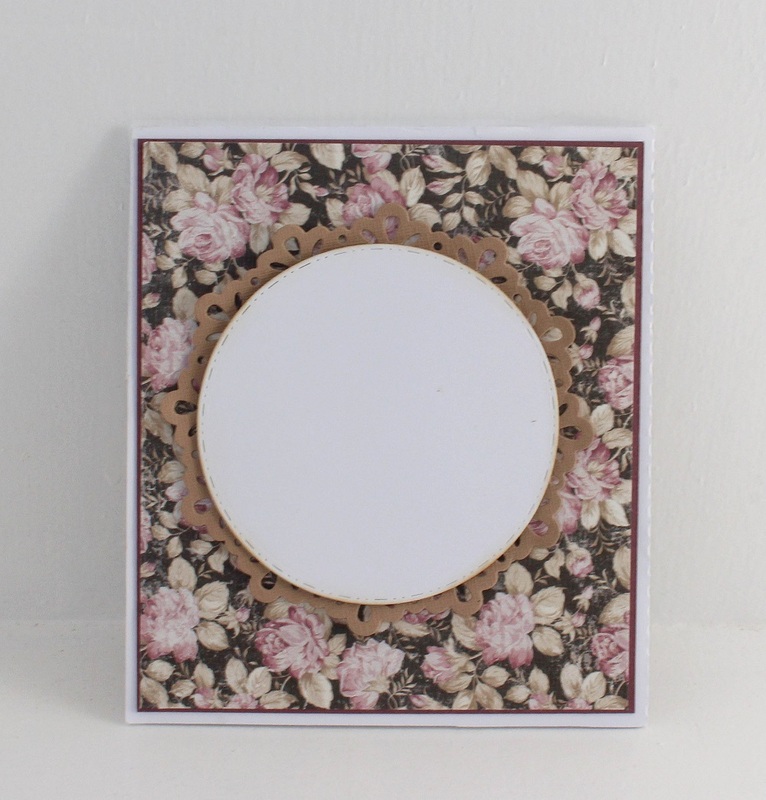 A die cut made with the Regal Frame die set. 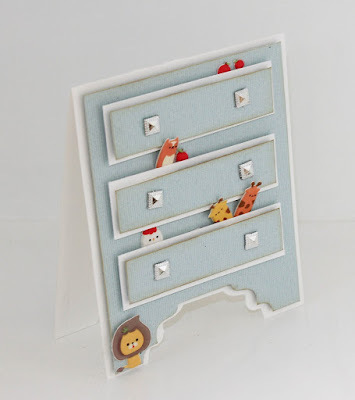 I do like to decorate cards inside and at the back. Here, they are simply decorated to finish the card. 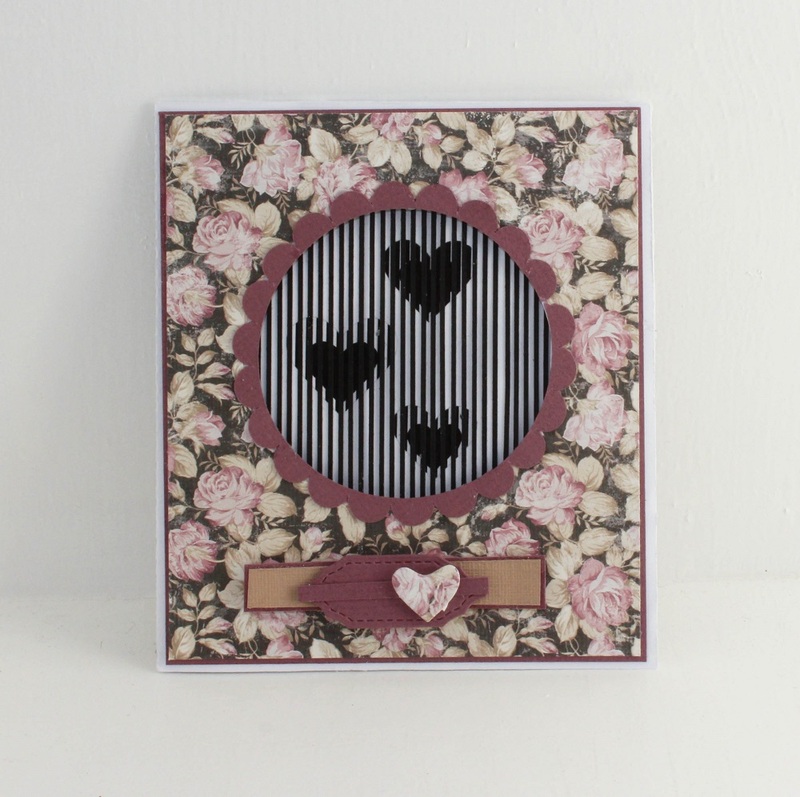 The hearts at the back of the card has been created with the New Heart Felt Dies set. Animated cards - How do they work? Animated cards have been out for a few years. 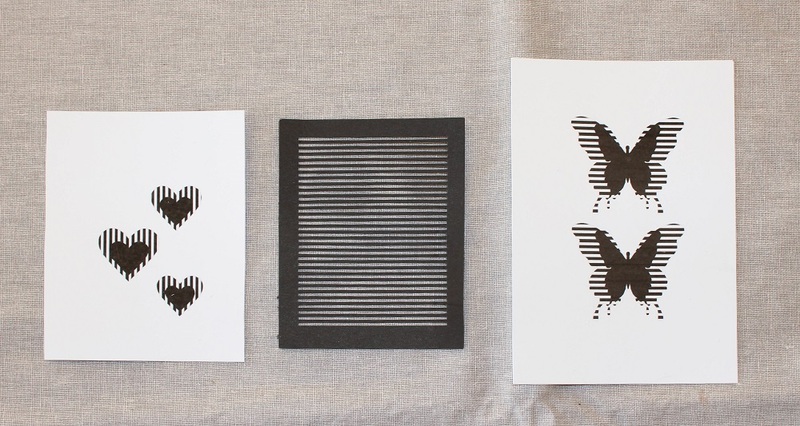 These cards are called Analog Lenticular Card Animation. 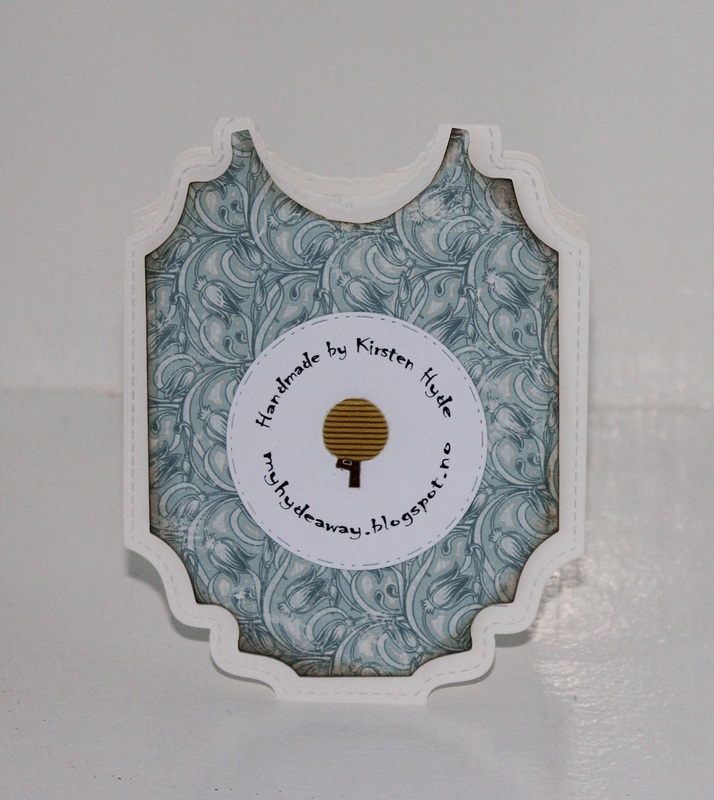 Last year, I could see the first sets of stamps-acetate-dies for sale, to create these cards. I don't have any og these, but I really wanted to figure out how they work. The cards are based on a grid and a motive based on the grid. 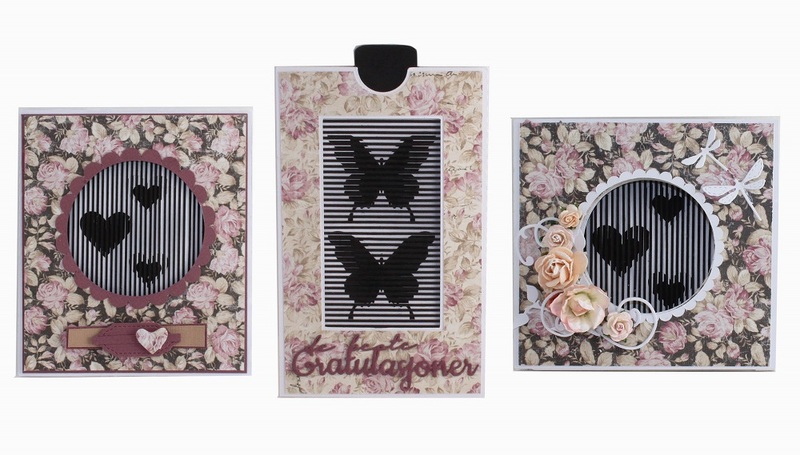 These cards has been created with papers from Maja's new Celebration collection: Good times og Jubilee. All the three cards are made with the same grid system. 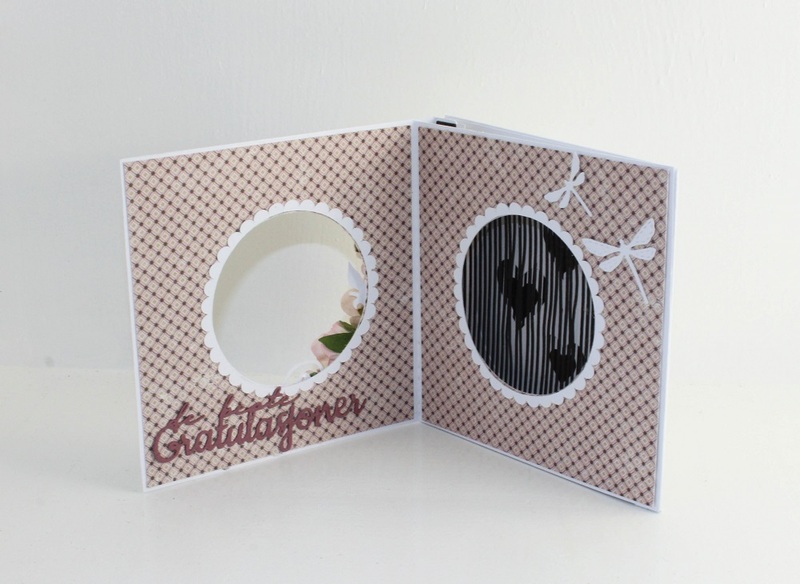 The grid is moving, and the butterflies and hears are mounted inside the cards. 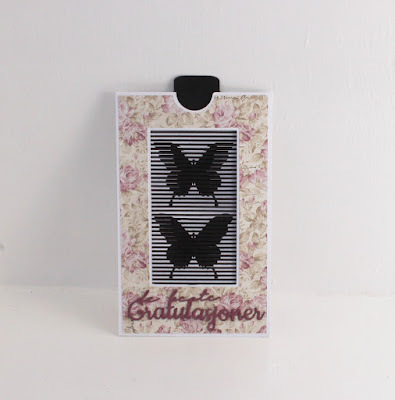 The grid on the butterfly card is moving vertically (up and down) with the stripes going horizontally (side to side). The grid on the heart cards are moving horizontally and the stripes are going vertically. The grid and the motives are shown below. I created the grid with a Silhouette, and drew the hearts and butterflies based on the grid. The middle black of the hearts and butterflies will show all the time. The outer edges of the motives will only show when the black grid isn't covering the black lines of the motives. It's difficult to show the cards, only using photos, so I created a short film to show the cards. This tag has been created as a hollow card. The grid is moving as a tag inside the card. The paper is Maja design's Jubilee. 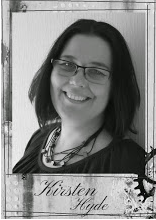 The text has been created with the dies "De beste gratulasjoner" from Papirdesign. 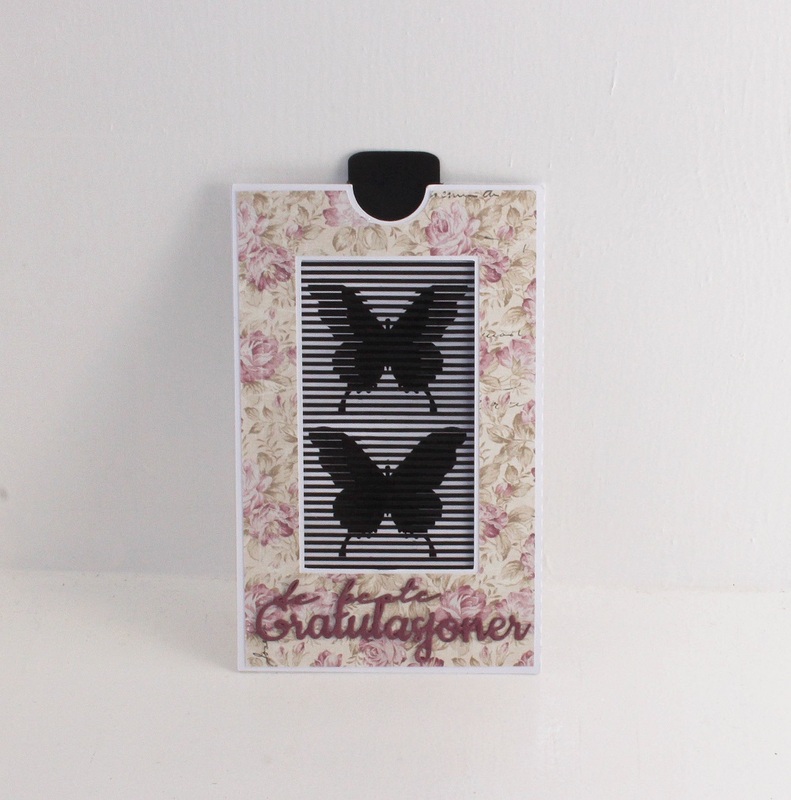 When you pull the black grid tag, the butterflies look like they are flying. 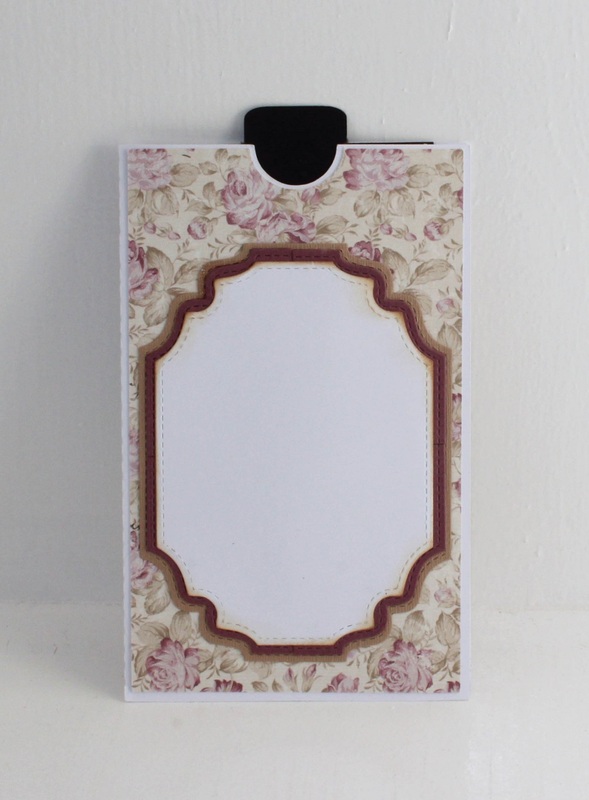 The back of the card has got space for writing a message. 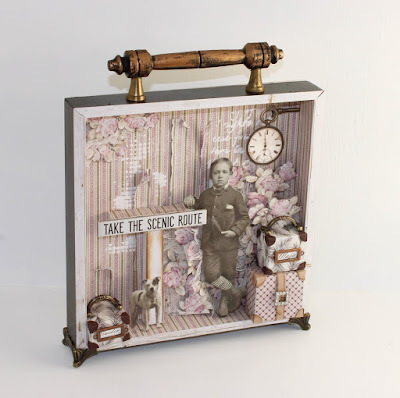 The dies used here is an LDRS creative dies: "Fancy Rectangles & Layers Die Set"
This tag has been created with the papers "Good times" from Maja design. 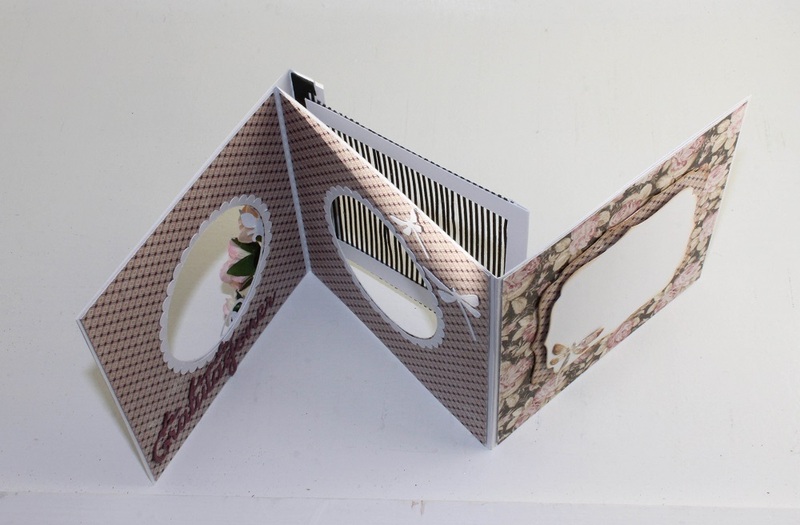 This card has been created as a hollow card. The black grid is moving from side to sid, as you move the slot at the bottom of the card. A you move the grid, the animation shows up. The back of the card has got space to write a messege. 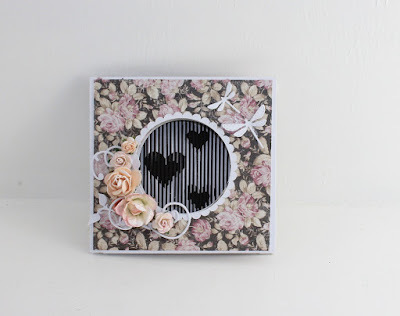 This has been created using dies from LDRS creative: Dotty Doily Die Set and Fancy Circles Dies. 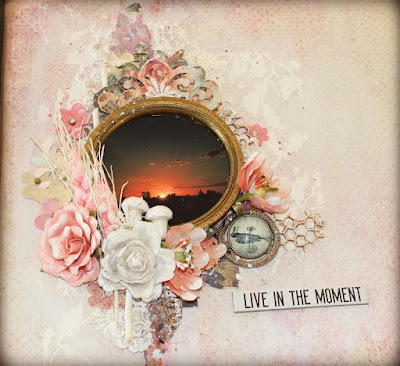 This card has been created with the papers "Good times" from Maja design. When you open the card, the animation of the hearts will show. 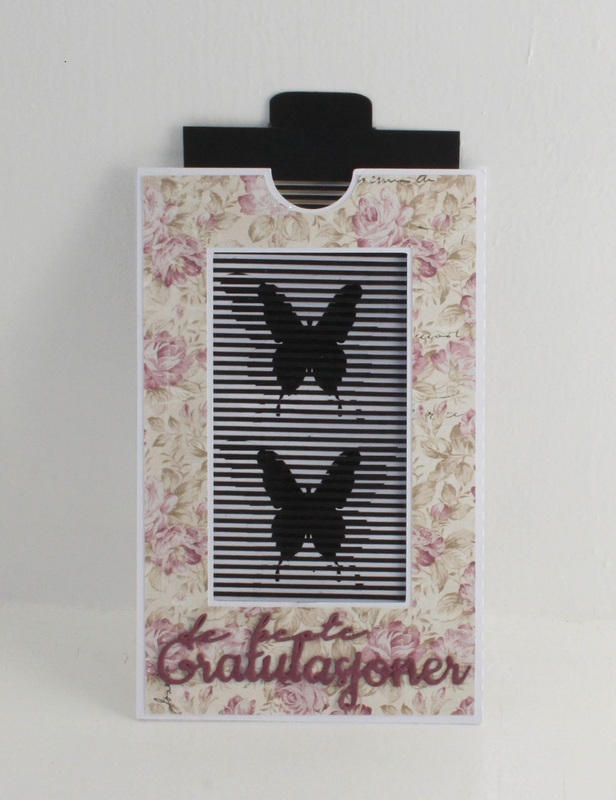 The text inside the card,"De beste gratulasjoner" has been created with a die from Papirdesign. The dragonflies has been created with a die from LDRS - Allifair Build-A-Card dies. 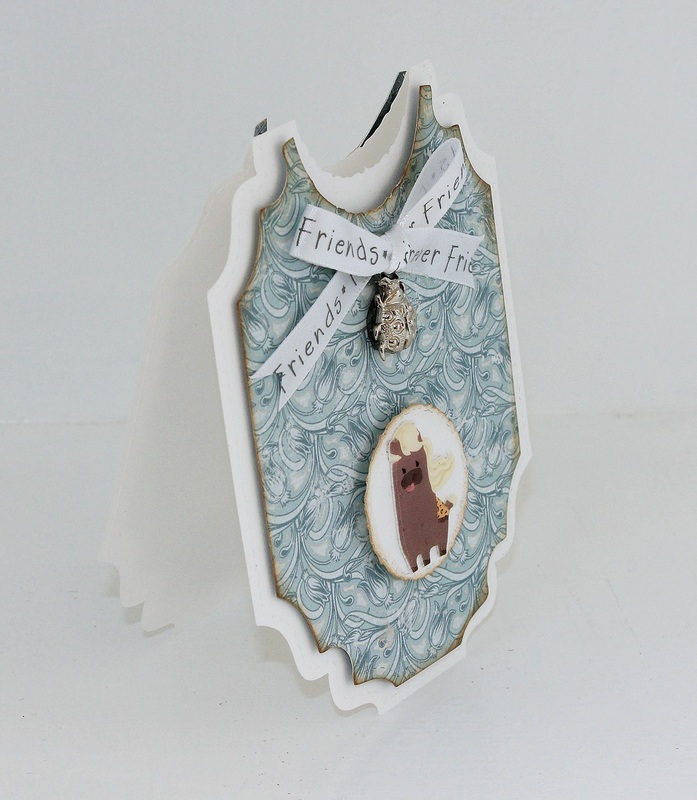 The card has been created, by gluing several parts of the card together. There is a front and a grid that belongs together. 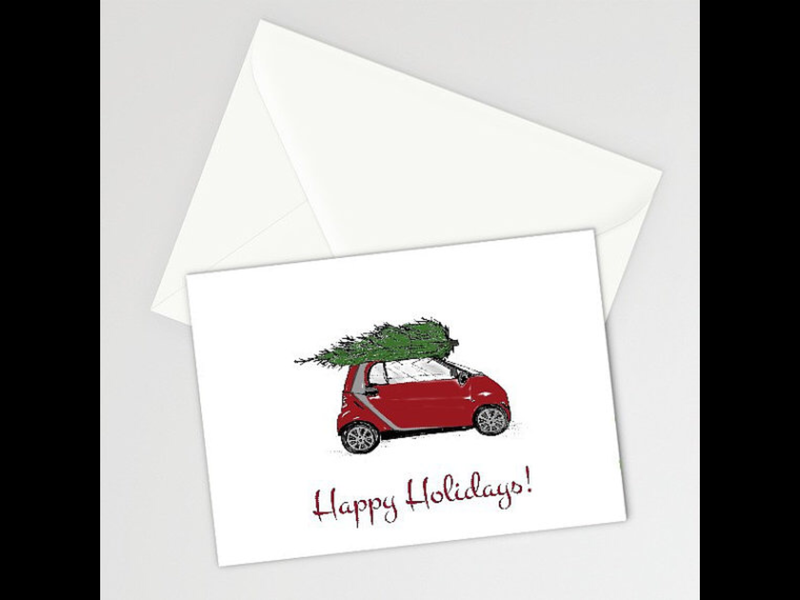 Then there is the back of the card. The grid has been placed about a cm away from the insideof the card. This makes the gridd move, when you open the card - and the animation will show.